Ever since the launch of Google Instant, there is a frenzy amongst users and tech savvy youngsters to use the technology on other popular sites and domains that feature or require search. First came the novelty apps Google Maps Instant and then YouTube Instant which landed the creator Feross Abou Khadijeh a job at YouTube via a Twitter message from the YouTube CEO Chad Hurley. 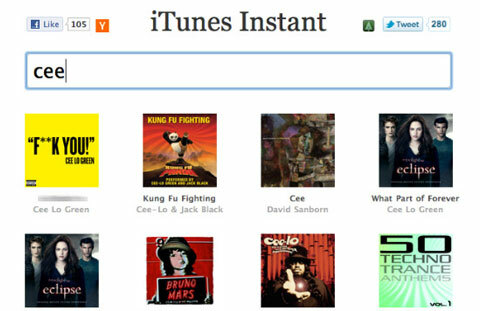 The latest domain getting the ‘instant’ treatment is none other than iTunes. What’s most interesting about this story is the age of the creator who is only 15. Stephen Ou describes himself as “15-year-old web developer. Cofounder of @pitch_ly. Previously created @OneExtraLap. Just made iTunes Instant. CodeIgniter addict” on Twitter and is currently getting a lot of attention and appreciation from all quarters. Search within iTunes.app is extremely slow and cluttered, I’ve never used it. So I used Apple’s Search API instead, and developed this app in less than three hours that will make your life better. All those who have started using the app report that it does work great and shows relatively accurate results in realtime even for somewhat obscure songs and artists. It was reported to be not so perfect when searching for both artist and song. It is surprising that Apple didn’t think of the idea themselves to make iTunes search better for millions of users and all it required was 3 hours in the hands of a 15 year old tech expert. It remains to be seen what response Ou gets from iTunes and whether he too lands a job like the YouTube Instant creator.